This well known game is popular with all ages. The players themselves act as the counters and move up the ladders and down the snakes on a 3m square plastic mat. Some extra rules have been added for even more fun. Giant snakes and ladders game comes with an inflatable dice and the mat comes complete with eyelets and pegs to keep the game fixed to the lawn. Durable and substantial, this giant version of snakes & ladders allows you to become part of the game. Packed in a compact 30cm square colourful box with carry handle. 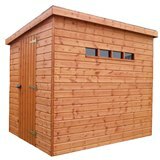 Traditional Security Shed Pent 3.66x1.83m a very secure garden shed. This arch is constructed from heavy duty timber, featuring a stunning round top. A Wentworth summerhouse 3.66 x 3.66m a traditional garden building ideal for year round use.